September 2017 – By Jack Garson. A guy you fired recommended you for the deal. “They” say it’s “the deal of the century”. You’ll be able to retire after this one. 3. “you could just discount your price—a lot”. You may think these people mean well. Nope. They’re con artists. Walk away. Sometimes, the best deal is no deal at all. C’mon, we all know how bad a bad deal can be. You lay there in bed wishing you had a time machine. You’d go back and tear up the contract. Yes, it’s that bad. But, you don’t have a time machine and you did sign the contract. Every day after that was T-O-R-T-U-R-E. The customer wasn’t happy with anything. He complained constantly. You’ll never forget those long, dramatic, spit-filled rants about you and your company’s many specific failings and general unsuitability for continued existence on Earth. Then, in the coup de grace, the customer did not pay. Yeah, that deal. They found that last one embroidered on a cute little sign floating in debris from the Titanic. Those “truths” are actually myths. Contrary to our super-macho American business mentality, some deals are not worth doing. “NO” is not a four letter word. Sometimes, “NO” is your best and only weapon. It doesn’t matter how fast you work, how smart you are or how you crush the competition. With some deals, the best thing to do is walk away. The point is not to kill deals. The point is to kill bad deals so that you can work on good deals. But, some entrepreneurs are concerned about getting rid of ANY customer. They worry that weeding out even their worst customers will leave them too reliant on just a few good ones. It’s a valid concern. You shouldn’t rely on just a few customers. Instead, diversify. Add more customers. But, don’t diversify by keeping—or adding—high-maintenance, low-profit, soul-crushing jerks that drain your bank account. You’re never going to retire working with these guys. Create Demand: You need to be better than your competitors. It’s different for every business. You probably already know what you need to do to get on top and stay there. If you don’t, study the superstars in your line of work. The point is: Don’t phone it in. If you excel at what you do, you’ll get good deals. Develop Self-Confidence: We’ve all heard that you won’t get something if you don’t ask for it. Well, you won’t ask for a good deal, if you don’t feel you deserve it. Self-confidence is the key. When you believe in yourself, you won’t accept anything less than a good deal. Assert Yourself: I’ll explain. It can’t be a good deal if it isn’t fair. Now you explain it to the other side. Consider this real-life story. I’ve changed the names. Okay, I’ve changed the facts, too. But, the point is 100% true. A really nice client calls me and asks me to review one particular paragraph out of a 150-page contract. He has the rest “under control.” So, I review my one assigned paragraph. Out of curiosity, I look at the rest of the contract. Oh, the horror! The contract is like one of those grass-covered pits with poison tipped spears pointing up—a trap for the unwary and unfortunate. I warn my client about the contract. He shrugs me off. So, dutifully, I revise my one assigned paragraph. But, I feel like I just gave a pedicure to a corpse. What’s going on? My client is afraid. He doesn’t think he has anything special to offer. So, he has no self- confidence. He feels that if he is too demanding, he’ll lose the deal. So, he doesn’t rock the boat—even if “rocking the boat” is simply insisting on a fair deal. But, folks, this one is like gravity. It is not a matter of opinion. 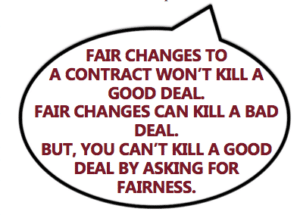 You can’t kill a good deal by insisting on fairness. A lot of people try to convince themselves that a terrible, awful, unfair contract is not a problem if the price-tag is high enough. But, with that kind of “bargain,” you may never see any money—not with all of those terrible, awful, unfair provisions. And if you ever do get paid, you did plenty of extra work to get it. It’s a classic con. Some scammer waves big dollars in the air. Then, watch all of the people walking barefoot on broken glass trying to get it. Walk away. Say “NO” to the bad deals. Be the best. Believe it. Market it. Insist on good deals with good clients—and then deliver. Customizing Your Lease: One Size Fits All? 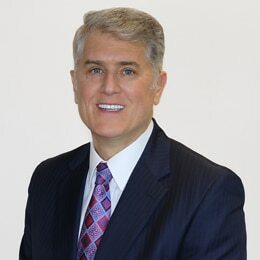 You’re Ready to Sell Your Firm, But is Your Lease Ready? 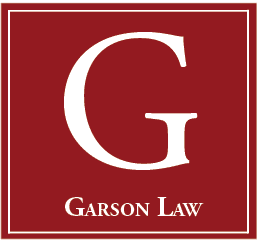 What is it that sets Garson Law apart? We believe it is our commitment to quality, responsiveness and results.